June 29. Lake Norman-area business leaders, ranging from bankers and racing executives to commercial real estate brokers and manufacturers, will travel by bus to the North Carolina State Capitol tomorrow to visibly join the fight against the public-private partnership that would widen I-77 with toll lanes. “I intend to call out that the NCDOT has the ability to cancel the project at their convenience according to the contract,” says John “Mac” McAlpine V, organizer of the bus ride. Nearly three dozen business leaders from Lake Norman will attend, including Mike Russell, chairman of the Lake Norman Chamber of Commerce. The chamber under his direction came out against the toll plan this month, after more than two years without taking a clear position. A new poll of chamber members shows 94 percent are opposed to the toll plan, the same as a poll conducted by Business Today and Cornelius Today. The BusinessToday/Cornelius Today poll conducted April 28 showed 707 opposed to the toll plan, and 63 in favor. McAlpine, who is director of electronics at Michael Waltrip Raceworld, has the names of more than 200 businesses on petitions that he will present to legislators, including Sen. Jeff Tarte who has changed his position on the public-private “P3” project. He has proposed a bill to defund the state’s portion of the $650 million toll plan. Indeed, McAlpine says the NCDOT misled both elected officials and business leaders around the toll plan, which is outlined in a 50-year, 900-age contract with a company, Cintra, whose roots are in Spain. Of course, NCDOT says otherwise, explaining that the notion of a public-private partnership came out loud and clear in 2012, and most government officials got behind it. Where it all went wrong, according to McAlpine, was packaging it as an either-or proposition—either you accept a private company in a role previously held by government, or you wait decades for congestion relief. 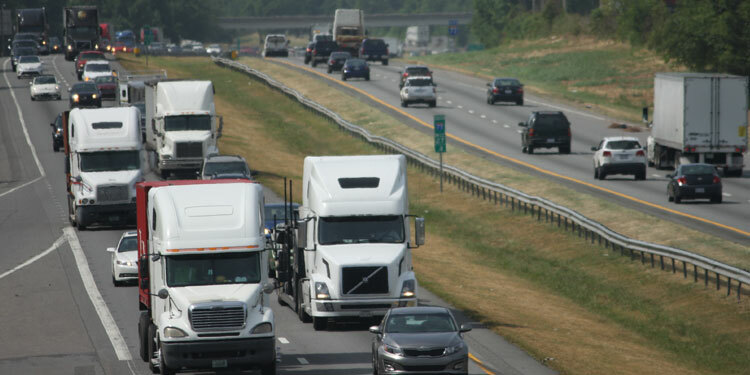 Warren Cooksey, the NCDOT community relations officer for this region, said it was actually clear in 2010, given “all the money in the world,” the state would use “managed lanes” for new traffic capacity between Charlotte and Lake Norman. Not doing so—adding general purpose lanes—is only a temporary solution. Cooksey, a former member of the Charlotte City Council, pointed to new GP lanes south of Charlotte that filled up in a matter of five years or less, putting congestion back where it was before the lanes were built. But, Gov. Pat McCrory got right into it when he proposed a $3 billion bond package for this fall’s ballot. It would fund new highways virtually all around the state. Except Charlotte. McCrory is standing by this plan that excludes Charlotte roads. Thus the bus trip. Among those going: Aquesta Bank CEO Jim Engel; John Hettwer, CEO of Payroll Plus; John Stritch, founder of Carolina Beverage Group; Champion Tire and Wheel General Manager Todd Carpenter; Greg Wallace, vice president of brand management at Rusty Wallace Inc.; and Sperry Van Ness Managing Director Tom McMahon. The roadblock in the legislature, of course, is the money. It could cost around $100 million to somehow void the Cintra contract. The $100 million cost would be borne by the state, and legislators around the state would have to agree to foot the bill. The flip side is the $13 billion that the tolls are expected to extract from the Lake Norman economy over the 50-year lifespan of the contract. “This has always been about keeping the pressure up to allow time to sway the governor to add to bond funding and get the businesses from our area to then support and get passed. [Tarte’s] bill isn’t end game, if the governor will provide an alternative, THEN the bill is the step needed to get out of this deal,” Puckett said. Business leaders will hold a press conference at noon tomorrow in the Capitol Building, McAlpine said. “Letting the project continue is something I, nor the business community is willing to accept,” he said. Great Piece! I would like to see Warren Cooksey’s comment about GP lanes filling back up debated more. His argument is anti-growth for the area as if the toll lanes are supposed to detour development. If GP lanes are built and they fill up in 5 years that means our region is growing, business is thriving, and my property value will go up. So how canhe argue the tolls will help growth again? Same old nonsense that we will have choices right?